Newport Beach – The Corona Del Mar boys lacrosse team halted its three game losing streak with a 12-8 win over Los Alamitos on Tuesday at Corona Del Mar High School. The Sea Kings were unable to shake a determined Griffins squad until the fourth quarter. “We just had to play harder. I didn’t feel that we played hard in the first half. We got off to a good start, and we kind of relaxed and everybody thought it was going to be an easy day and Los Al played hard. They weren’t going to just give it to us,” Sea Kings coach G.W. Mix said. Mix’s observations are reflected in the scoring. The Sea Kings appeared to establish control of the game after building a 4-0 lead in the first 10 minutes of the game, but the Griffins weren’t ready to call it quits. The Griffins closed out the first quarter with a three-goal flurry started by Lincoln Frazier at the 1:58 mark. Los Al evened the game early in Q2, and the two teams slugged their way to a 6-6 tie at halftime. After CdM’s Aidan Kelly scored and Los Al’s Ethan Campos intercepted a pass and took it all the way for a Griffins goal to open the third quarter, the game was looking like it was destined for overtime. But the Griffins got no closer, as the Sea Kings shut them out until the last minute of the game. “We started trying to force the ball. Once we started trying to force the ball in the fourth quarter, we lost sight of our team play and started to get into more individual play. Just like Foothill, we ran with one of the best teams in the county for three quarters. We just got to put together a full game and we’ll make it happen,” Los Al coach Tim Fox said. 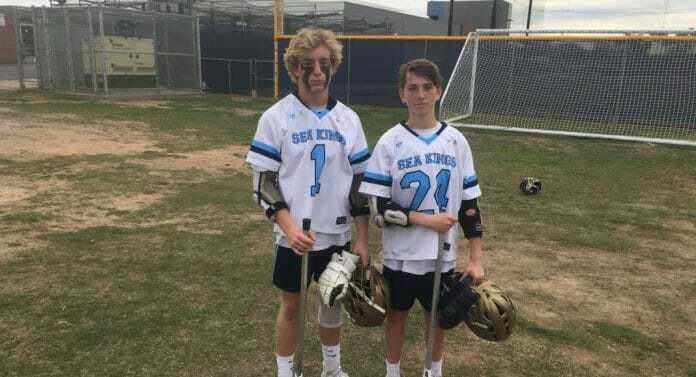 The Sea Kings were led by sophomores Kelly and Chandler Fincher who each had three goals while Simon Hall and Devon Linkon added two goals apiece. Tanner Beasy and Bobby Purcifull chipped in one goal apiece for the Sea Kings, who got eight saves from Kyle Cord. For the Griffins, Campos led the way with four goals while Frazier, Trenton Jones, Ed Shean, and Jack Doyle had one goal apiece. The Griffins also got 18 saves from Cullen Murray. Up next for the Sea Kings (4-3), a game against Granite Bay of Sacramento on Monday at Orange Coast College at 6 p.m. For the Griffins (2-6), their next game won’t be until Friday March 30, when they play Golden of Colorado at home at 6 p.m.